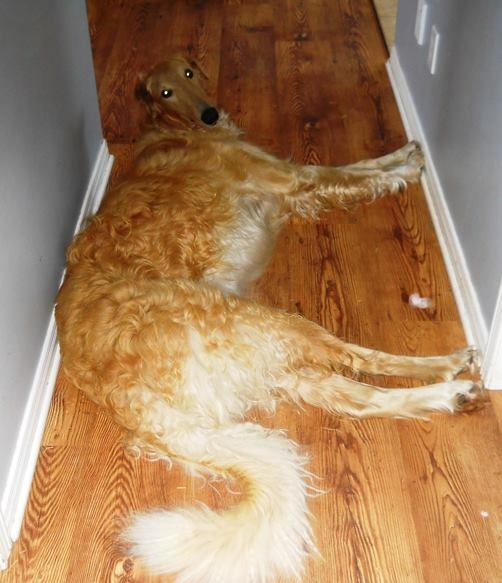 Got to watch your step when a borzoi decides to lay down in the hallway! Gandalf taking over the hallway! The origin of the Borzoi are distant and disputed, however all seem to agree that they originated in Russia by crossing an Arabian Greyhounds (sloughi/tazi) that the Russian Grand-duke Nickolai Nikolaievitch Romanov would have imported, and a native Russian breed that looked somewhat similar to the Collie of today, which provided the thin coated gazelle hound with a heavier coat in order for the dog to be able to withstand the severe weather and cold winters of Russia. The result of the crossing is that of a very graceful, elegant and aristocratic dog. The availability of abundant pictorial iconography available in the XIX century is a testament to the breed achieving its peak in popularity. However the liberation of serfdom by the Czar Alexander II in 1861 and the turmoil in rural Russia brought a major blow to the breed’s existence. Except for a few isolated kennels very few kennels were restored or maintained once the nobility returned to their estates. The Borzoi suffered another blow after the Russian Revolution of 1917, when many were slaughtered due to their association with the Czars and the aristocracy. Thankfully, as early as 1870 many Borzois were disseminated in a number of countries around the world. Many specimens came from a few great Kennels namely; Perhina, which was owned by the grand-duc Nicolaï Nicolaïevotch Romanov, and another influential Russian Kennel Woronzova, which was the one owned by Mr. Artem Balderoff. These exports were instrumental in the restoration of the breed. TODAY… the Borzoi has become a companion dog rather than the elite hunter of the past. However Russia has managed to rebuild its herd where it still enjoys the pleasure of the traditional hunt. In most other countries the hunt is simulated by holding lure coursing events and trials as a popular sport for Borzoi and many other sighthounds. The Borzoi was first registered in Canada over a century ago in 1892. 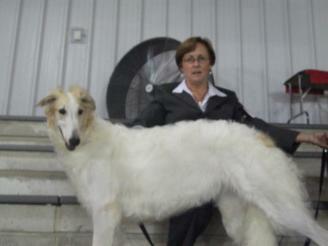 Canadian bred Borzoi contributes significantly to the success of the breed’s existence. The borzoi is a gentle and highly sensitive, calm and independent dog. They will show devotion to their family but become more aloof or reserved towards strangers. In addition they are quiet barking very rarely, which is a good thing if they are to be homed in a suburban area, to which they adapt very well on the condition they have a spacious fenced-in yard and regular opportunities for free exercise, which also helps to ensure the dog remains physically and mentally fit. They do not have strong territorial drives and cannot be relied on to raise the alarm upon sighting a human intruder. The hunting instinct can be very strong in certain individuals and you must be aware of this trait. I often take mine for walks and have come across a few wild rabbits that dared to get very close, or crossed our path, and thankfully I always keep a strong hold on the leash because I would have easily been dragged away or worse the dog would have just run off after its quarry. Since these dogs were bred to course and hunt game they can easily cover long distances in a very short time which is why a fully fenced yard is imperative for keeping any sighthound, and walking off-lead is not recommended to ensure its safety. On the other hand as adults they are decorative couch potatoes with remarkably gracious house-manners. A good and stable temperament is absolutely essential in this breed and reputable breeders strive to maintain the gentle, affectionate and loyal temperament that defines soundness of mind in the Borzoi. The Borzoi was bred for its ability to be the hunter and work as a team in the hunt. So by definition, this is an independent thinker. 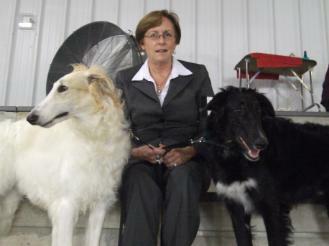 When training a Borzoi, it is a must to keep this fact in mind and train him to work with you and not for you. The Borzoi's coat normally comes in all colours, usually parti-coloured. The coat is silky, flat or wavy and short in some parts. Anne Midgarden D.V.M. Did a wonderful empirical study of how the performance and speed of a borzoi is related to its confirmation . Visiting with frends and all the dogs are playing together, borzoi, deerhound and chinese crested.